The undisputed king of the wire obstacle is the “Triple Strand” made with Concertina. It is by far the most common wire obstacle employed on the modern battlefield because of its ease of emplacement. A group of soldiers can setup one of these obstacles very quickly (assuming they have a little experience at it and have the necessary materials on hand). Because it’s so universally used, it comes in a very wide variety of configurations. An obstacle emplaced by combat engineers will probably have a double row of pickets and be crisscrossed with additional wires to prevent crushing. One emplaced by some infantry would likely only have a single row of pickets, and they won’t have bothered to stake the wire down to the ground. Keep this in mind when making your own gaming terrain since a by-the-book approach and a minimalist approach are both equally valid realism wise. Assembly of the Triple Strand is very straightforward. Start with a good sturdy base and attach your pickets to it. We recommend using nails (preferably galvanized ones) for it just like on the security fences. 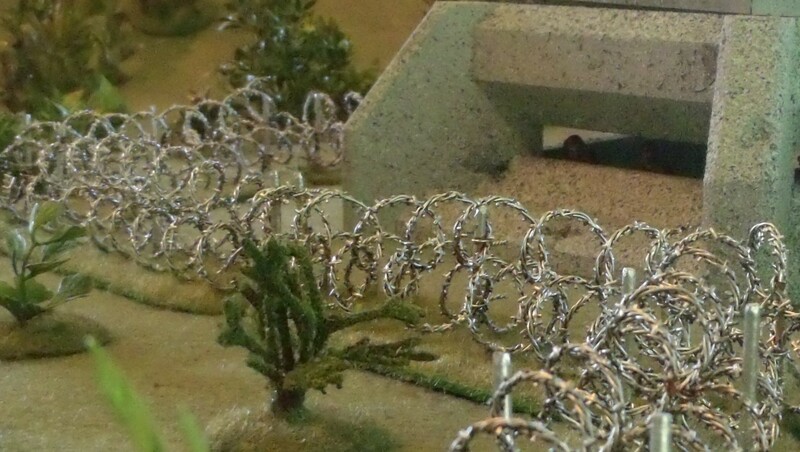 Then add your Concertina wire (tutorial here) and secure it to the pickets with some twist ties. Now, just paint and flock and to finish up.